On Simchat Torah there are communities which refuse to let women dance with the Torah scrolls, even if the men’s and women’s dancing are separated, not merely because it is not traditional but for halachic reasons. In a statement made by the halachist Rabbi J. Simcha Cohen in 2010, one of the objections is the analogy of women wearing tefillin (Shulchan Aruch Orach Chayyim 38:3), in relation to which the point is made that a woman cannot guarantee to have guf naki, a “clean body”. When Michal the daughter of Saul put on tefillin she was known to be exceptionally pious and careful. Since the Sefer Torah is holier than tefillin, the argument was raised that the same rule should prohibit women from dancing with the Torah. However, what is under discussion is not wearing the Torah but holding it, and it is not the Torah parchment which the person touches but the handles or cloak. In his glosses to the Shulchan Aruch, the Rema states that there is no prohibition on a woman touching a Sefer Torah. In any case, there is a question as to whether even men’s dancing with the Torah is required. 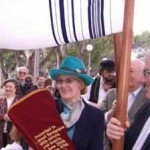 This entry is filed under Articles, Festivals & Fasts, Simchat Torah, Women's Issues.